While we do need salt in our diet, it’s much less than we think. Here’s how to tell if you’re eating too much of it. When it comes to salt, a little goes a long way. While we DO need sodium (the main ingredient of salt) to maintain good health, it’s a lot less than we think. Just a single teaspoon – up to 2,300 mg – does it for one day. Salt-sensitive people should consume an even smaller amount: less than 1,500 mg per day. But most people are eating at least 2-3 times more than the recommended amount. So why is this such a problem and where is all this dietary salt coming from? Why is too much salt a problem? Sodium chloride – what we refer to as “salt” – is important for the proper function of all the cells in the body. And it’s one nutrient requirement no one has to work hard to meet! The problem is how to cut back: years of scientific study show that too much sodium can contribute to high blood pressure and risk of stroke, among other heart-related ailments. This is most important for people already diagnosed with high blood pressure or those at greater risk for developing high blood pressure: adults over age 50, African-Americans, overweight individuals, or anyone with a family history of high blood pressure. Where is the salt in the foods we eat? It surprises most people that nearly 80 percent of the salt we eat comes from processed foods – things found in boxes, cans and other packages. Only about 10 percent comes from the salt shaker and another 10 percent from natural salt found in foods. Eat less processed foods: Downsize your use of packaged and canned products. Aim for more fresh or frozen fruits and vegetables. Avoid canned soups: Some contain nearly one-third of your daily salt recommendation in just one serving. And there are usually 2-3 servings per can. 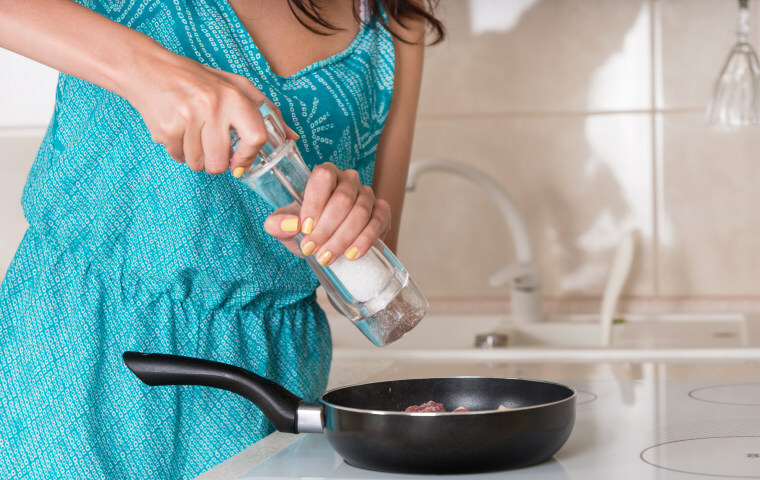 Read labels, choose reduced and low sodium products: It’s not realistic to eliminate all packaged foods, so look for products with reduced (25 percent less) or “light” (50 percent less) sodium compared to the original product. Downsize your use of high sodium condiments: Limit your use of soy sauce, ketchup, salad dressings, dips, jarred sauces and relish. These are all sodium rich and soy sauce has nearly half of your daily recommendation in just one tablespoon. Season foods with herbs and spices: Cutting back on salt doesn’t mean compromising flavor. Try fresh or dried herbs or citrus rinds instead of the salt shaker. And look for combination herb and pepper blends that are sodium free – they’re loaded with flavor. Taming your “salt tooth”: Just like a “sweet tooth,” your taste buds have learned to respond to extra salt in your diet. The good news is that you can unlearn this taste preference! By gradually decreasing your daily salt intake from all sources, your taste buds will adjust with no problem and you’ll gradually decrease your craving for salty foods. Always talk to your doctor before making any major changes to your daily eating and sodium intake, especially if you have high blood pressure or are at risk for it. If you need more personalized support, a visit with a registered dietician is another smart option.